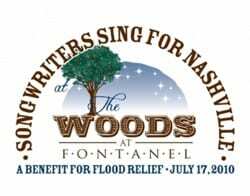 This Saturday’s (7/17) Songwriters Sing For Nashville flood relief benefit at The Woods at Fontanel has added more performers to the line-up, including (in order of appearance) Lari White, Chuck Cannon, James House, Danny Flowers, Rafe Van Hoy, Billy Burnette, Marc Beeson, James Slater and Danny Myrick. The newly-added group will play on the Gibson Tunesmith Stage at the Farm House Restaurant from noon until 4:00 p.m.
Songwriters already announced for The Woods stage from 4:30 to 8:00 p.m. include Roger Murrah, Matraca Berg, Kye Fleming, Dallas Frazier, Dickey Lee, Dennis Morgan, Hugh Prestwood, Mark D. Sanders, Don Wayne, Jim Weatherly and Mike Reid. This will be the first concert at the new venue. Tickets at ticketmaster.com. The CMA Songwriters Series will return to New York City’s Joe’s Pub for two shows on Wednesday, Sept. 8. Representing Nashville will be hitmakers Jamey Johnson, Buddy Cannon, Bobby Pinson and Bob DiPiero, who will also host the evening. With tons of charttoppers between them, this group is sure to impress music lovers in NYC. Tickets are $25, details at www.joespub.com. « New ZBB Album Coming In Sept.